Do you need to accelerate your OLTP applications, or improve service levels of your VDI infrastructure? Do you want to use advanced analytics to make faster decisions? HP 3PAR StoreServ 7450 Storage speeds performance for your applications without compromising your business. It delivers hundreds of thousands of IOPS at less than 1 millisecond, with the same level of resiliency, efficiency and disaster tolerance available on 3PAR StoreServ tier 1 systems. Achieve sub-millisecond response time for critical applications while lowering data center power consumption and space requirements. The quad-controller active-active architecture scales non-disruptively to four nodes, adding performance and capacity, while persistent technologies enable you to maintain service levels in situations such as online firmware upgrades and unplanned site failures. With accelerated performance coming on a reliable architecture, HP 3PAR StoreServ 7450 storage delivers performance without any compromises. The HP 3PAR StoreServ 7450 Storage system is the only all-flash array in the industry that delivers the performance advantages of a purpose-built, flash-optimized architecture without compromising resiliency, efficiency, or data mobility. It does this with a flash-optimized architecture that reduces the performance bottlenecks that can choke general-purpose disk arrays that have been retrofitted by stuffing them with solid-state disks (SSDs). However, unlike other purpose-built arrays on the market that solve SSD performance issues by introducing an entirely new architecture, the HP 3PAR StoreServ 7450 doesn't ask you to sacrifice rich Tier 1 data services, advanced features, or enterprise-class efficiency, resiliency, and data mobility. As a result, not only does HP 3PAR StoreServ 7450 Storage accelerate business agility by boosting application performance with over 550,000 IOPS at less than 0.7 milliseconds (ms) latency, but it delivers all the enterprise-class, Tier 1 features and functionality you have come to expect from the storage platform that powers 3 of the world's 4 largest Managed Service Providers (MSPs).1 It's performance without compromise. HP 3PAR StoreServ Storage is unique in that the same effortless, efficient, bulletproof, and future-proof storage platform scales to address the needs of the entire midrange, Tier 1 enterprise, and service providers, accommodating both spinning and flash-based media. The same common operating system, a single user interface, and the same set of rich data services and features are shared across the entire platform—regardless of model (figure 1). As a result, you'll be able to accelerate applications where milliseconds represent millions of dollars and make decisions based on analytics in hours and minutes vs. days or weeks. You'll be able to stretch your flash-based media investments to new levels by halving capacity requirements. You'll gain peace of mind in knowing that your performance-critical applications are backed by storage with Tier 1 resiliency. You'll be able to increase agility and balance performance and cost by seamlessly moving data across systems and sites. Software optimizations like HP 3PAR Adaptive Read and Write: Enable a more granular approach than with spinning media by matching host IO size reads and writes to flash media to avoid unnecessary data reads and writes. This significantly reduces latency and enhances backend performance to enable more applications to be consolidated. Autonomic Cache Offload: A new flash software-based optimization that reduces cache bottlenecks by automatically changing the frequency at which data is offloaded from cache to flash media, based on utilization rate and without requiring any user intervention. This helps achieve consistently high performance levels as you scale the workload to hundreds of thousands of IOPS. Multitenant I/O processing: Enables performance improvement for mixed workloads or virtual desktop infrastructure (VDI) deployments by breaking large IO into smaller chunks so that small read requests don't get held up or stuck behind larger IO requests, which helps ensure reduced latency. Unique, clustered, Mesh-Active architecture: Fine-grained virtualization and system-wide striping shared by HP 3PAR StoreServ Storage delivers capacity and performance that scale automatically, even at extremely high capacity utilization levels. Purpose-built HP 3PAR StoreServ ASIC: Supports mixed workloads with extremely high performance levels to alleviate legacy storage performance concerns. HP 3PAR StoreServ 7450 Storage helps you radically improve efficiency, making an all-flash storage array more affordable for a wider range of applications than ever before. Unlike bolt-on thin storage solutions on legacy arrays, HP 3PAR StoreServ 7450 all-flash arrays feature hardware-enabled thin technologies that allow systems to run in a state of consistent high capacity utilization without any performance tradeoffs. In fact, the HP Get Thin Guarantee promises new HP 3PAR StoreServ customers at least 50 percent reduction in capacity requirements by simply replacing legacy storage with HP 3PAR StoreServ Storage—guaranteed. Proactive Media Management: The HP 3PAR Operating System constantly monitors flash-based media utilization and wear to enable proactive reporting of possible media failures for effortless management. You can stay informed on the expected life of your flash-based media by monitoring the wear levels of each flash device at any given time. Never be caught off guard by planning for future upgrades before your flash-based media is worn out. Fine-grained allocation unit: With its 16 KB write allocation unit, the HP 3PAR StoreServ Storage platform has long been known for pioneering innovation in storage capacity efficiency. A granular allocation size enables only the right amount of flash media to be allocated, thereby avoiding any waste due to unused allocated flash capacity. System-wide striping and sparing: The HP 3PAR StoreServ Architecture stripes data across all system resources (controllers, ports, cache, and drives). This system-wide striping enables the array to simultaneously deliver uniquely high capacity utilization (no silos of any kind) and performance levels (all resources supporting each volume). This drives uniform IO patterns across all media resources by spreading wear evenly across the entire system. Should there be a media failure, system-wide sparing also helps against performance degradation by enabling many-to-many volume rebuilds, which are faster. Because the system automatically manages this system-wide load balancing, no extra time or complexity is required to create or maintain optimally better configured system. Highly virtualized storage OS: To enable performance and to help maximize the utilization of physical resources, the HP 3PAR Operating System employs a tri-level mapping methodology similar to the virtual memory architectures of one of the most robust enterprise operating systems on the market today. The first level of mapping virtualizes physical drives of any size into granular allocation units or chunklets. Complete access to every chunklet reduces large pockets of inaccessible storage. The second level of mapping associates chunklets with Logical Disks (LDs). It is at this second level that RAID characteristics are implemented. The third level of mapping associates Virtual Volumes (VVs) with all or portions of an underlying LD or of multiple LDs. The fine-grained 3-level virtualization enables a single flash media device to support hundreds of volumes and up to a dozen RAID definitions at the same time, allowing the system to make the most efficient use of flash. Zero-detect ASIC: The HP 3PAR StoreServ ASIC features an efficient, silicon-based zero-detection mechanism that gives HP 3PAR StoreServ Storage the power to remove allocated but unused space without impacting performance. On top of powering HP 3PAR Thin Technologies, this capability also removes streams of zeroes present in write IO prior to writing that data to flash-based media. In the world of flash-based storage, where there is penalty for every single write (in terms of endurance), this write elimination helps to elongate media life considerably. Not only can you reduce capacity requirements by up to 50 percent, but you also extend the life of your valuable flash media by avoiding unnecessary writes. In order to meet service level demands for performance-critical applications, high availability and uncompromising data protection are must-haves. With HP 3PAR StoreServ 7450 Storage, you can decrease downtime while dramatically reducing the cost of remote data replication and disaster recovery (DR) with highly efficient, multi-mode replication across all HP 3PAR StoreServ models. HP 3PAR Remote Copy software allows you to achieve low recovery-time objectives (RTOs) and zero-data-loss recovery-point objectives (RPOs) with complete distance flexibility. And since HP 3PAR Remote Copy configuration is now autonomic, meaning it is completed in one step, you can protect your data from the start. 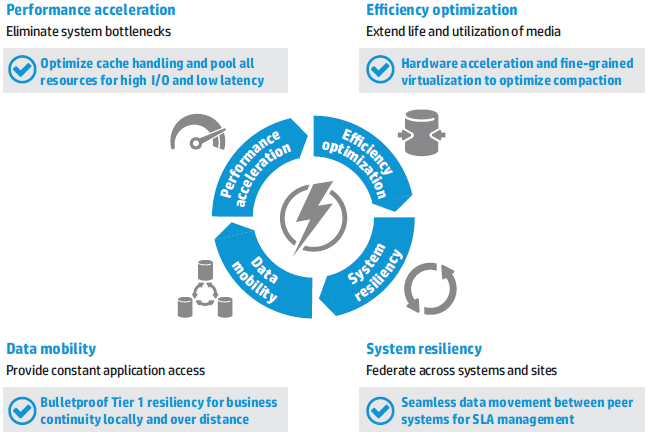 A unique suite of persistent technologies power HP 3PAR StoreServ 7450 Storage in delivering high availability and Tier 1 resiliency to performance-critical applications. HP 3PAR Persistent Cache preserves service levels, so they are not impacted by unplanned component failures—a key requirement for the virtual data center. HP 3PAR Persistent Ports allows non-disruptive upgrades to HP 3PAR StoreServ 7450 Storage systems without relying on multipathing software and without initiating failover. Effortless resilience is delivered by HP 3PAR Peer Persistence software, which now comes with VMware vSphere Metro Storage Cluster (vMSC) certification. With Peer Persistence, you'll also be able to federate storage across data centers without being constrained by physical boundaries. Automated failover and failback between two sites or data centers is transparent to hosts, which keeps your VMware deployments seamlessly running even in the event of a disaster. The HP 3PAR StoreServ Data at Rest Encryption solution protects data from both internal and external security breaches. If your application or environment requires protection from unauthorized access of the data on a drive, then consider the HP 3PAR StoreServ Data at Rest Encryption solution. HP 3PAR StoreServ models are available with self-encrypting drives (SEDs), where data is encrypted as it is written to the drive. You get the peace of mind in knowing that all data contained on these drives is protected against unauthorized access, regardless of hardware theft, drive failure, or drive retirement. In case of a flash-based media failure, HP 3PAR StoreServ Storage handles reconstruction of flash media in a different way than it handles reconstruction of spinning media. Instead of doing large sequential reads/writes that happen for HDDs, HP 3PAR StoreServ performs 32 KB read/write I/Os for flash media. This enables the system to provide consistent performance levels even under situations of flash media failure, since large sequential writes can typically cause flash media to degrade. For your business to deliver consistently with great application performance at an affordable cost, your storage architecture must allow data to move easily to keep up with the pace of change. At times of peak demand on certain applications, you want the associated data placed on your fastest storage technology. You need the flexibility to meet different service levels without having to manage multiple storage islands with incompatible management interfaces and data service technologies. Meet the needs of today's data center with the ability to move data and workloads between arrays without impact to applications, users, or services. With HP 3PAR StoreServ Storage, you can simply and non-disruptively shift data between the HP 3PAR StoreServ 7450 all-flash array and any other 3PAR StoreServ array without additional management layers or appliances. Map workloads to the right resources and establish tiers of storage across the data center for different service level agreements (SLAs). Lower costs and manage capacity at a data center level by thinly provisioning volumes with the freedom to move data between systems. Refresh technology effortlessly by streamlining the movement of volumes from older systems and non-disruptively update storage without application impact. Capacity 96TB Raw Maximum supported capacity. Expandable to 240 total SAS drives with M6710 and M6720 drive enclosures. Differentiator HP 3PAR StoreServ 7450 4-node base with two 2U enclosures, four controller nodes, 128 GB cache, eight 8Gb/sec FC ports, four adapter slots, and 48 SFF drive bays. HP 3PAR StoreServ Storage supports the same OS and software offerings as the other members of the HP 3PAR StoreServ family. As with all HP 3PAR StoreServ models, you have the opportunity to purchase software bundled into a series of suites designed to simplify purchasing and save you money. Selected software titles may also be purchased separately, as indicated below. HP 3PAR Operating System Software Suite Required for all new HP 3PAR StoreServ systems, this foundational software suite gives you everything you need to get up and running quickly and efficiently. This suite includes the HP 3PAR Operating System, HP 3PAR Management Console, HP 3PAR Host Explorer, and HP 3PAR SmartStart*—software designed to get you off to a quick start with your new HP 3PAR StoreServ system. It also includes all of the platform's thin software offerings—HP 3PAR Thin Provisioning, HP 3PAR Thin Conversion, and HP 3PAR Thin Persistence. Other highlights of this suite include HP 3PAR Full Copy, autonomic rebalancing capabilities that help you get optimal use out of future capacity expansions, and support for standard multipathing software for high availability in clustered environments. A 180-day license for online import is included to enable migration from HP EVA Storage. HP 3PAR Replication Software Suite This optional suite bundles HP 3PAR Virtual Copy with HP 3PAR Remote Copy software, both also sold separately for all HP 3PAR StoreServ models. Included in this bundle is Peer Persistence, which enables peer federation for VMware clusters to improve overall availability. Licensed based on system capacity. HP 3PAR Data Optimization Software Suite This optional software bundle combines HP 3PAR Dynamic Optimization, HP 3PAR Adaptive Optimization, HP 3PAR Peer Motion, and HP 3PAR Priority Optimization software so you can move data and workloads between arrays without impacting applications, users, or services. Licensed based on system capacity, the four software titles bundled in this suite are also sold separately for all HP 3PAR StoreServ models. Depending on purchase date, titles included in this suite may vary. For the 10000 models only, HP 3PAR Optimization Suite is available and includes Adaptive Optimization and Dynamic Optimization. HP 3PAR Security Software Suite This optional suite bundles HP 3PAR Virtual Domains and HP 3PAR Virtual Lock Software, both also sold separately for all HP 3PAR StoreServ models. With this suite, you can segregate access and deliver robust storage services for different applications and user groups with additional security attached to the retention of storage volumes. Licensed based on system capacity. HP 3PAR Application Software Suite for VMware Everything you need to make your VMware environment more agile and efficient—including HP 3PAR Recovery Manager for VMware, Host Explorer for VMware, VASA support, and three essential plug-ins: the VMware Site Replication Manager (SRM) Adapter, the HP 3PAR VAAI Plug-in, and the HP 3PAR Management Plug-in for VMware View. This suite is optional and licensed on a per-system basis. HP 3PAR Application Software Suite for Hyper-V Protect your Microsoft Hyper-V environment with HP 3PAR Recovery Manager for Microsoft Hyper-V and the HP 3PAR VSS Provider software, included in this optional suite and licensed on a per-system basis. HP 3PAR Application Software Suite for Exchange This bundle gives you the essentials for use with Microsoft Exchange, including HP 3PAR Recovery Manager for Exchange and the VSS Provider software. This suite is optional and licensed on a per-system basis. HP 3PAR Application Software Suite for Oracle Everything you need for protecting Oracle Databases, including HP 3PAR Recovery Manager for Oracle and Oracle space reclamation capabilities, sold as an optional suite and licensed on a per-system basis. HP 3PAR Application Software Suite for SQL Protect Microsoft SQL DB with HP 3PAR Recovery Manager for Microsoft SQL and the HP 3PAR VSS Provider software, bundled with this optional suite and licensed on a per-system basis. HP 3PAR Reporting Software Suite Enhance system visibility and reporting capabilities with this optional suite, which includes HP 3PAR System Reporter software and the HP 3PARinfo application, licensed on a per-system basis. * HP 3PAR SmartStart is available for the 7200, 7400, and 7450 models only. Choose from a rich portfolio of services to make the most of HP Storage, so you can move with confidence to take full advantage of the broadest, most advanced portfolio in the industry. If none of our support recommendations meets your needs, we can tailor a service solution for your unique support requirements. Only HP brings together deep expertise, proactive and business-critical support, and a strong partner network—plus a full set of infrastructure services designed to power a converged infrastructure. Download the HP 3PAR StoreServ 7450 Storage Datasheet (PDF).